Battlefield V Coming This Year, WW2 Setting | Nerd Much? We’ve known that the next entry in the Battlefield series would be headed our way in 2018. However, despite a few rumors, we had no idea what that game would actually be. Now, thanks to a report from GamesBeat, it looks like we’re getting a sequel to 2016’s Battlefield 1. However, this version will be entitled Battlefield V.
GamesBeat stated that internally, the next Battlefield was being labeled as Battlefield 2. This was a homage to Battlefield 1 being set during World War 1. And it made sense as this game would be a sequel to both Battlefield 1 and World War 1. It was also confirmed by the outlet that this is in no way a remake of 2005’s Battlefield 2. 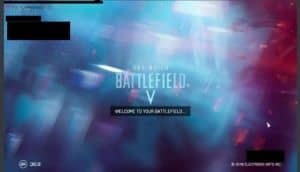 A logo screen for Battlefield V appears to have leaked online as well. Although it’s specifically listed as being for a Dev Build, it still looks official. There were previous rumors swirling the web that the next Battlefield game would be a continuation of the Bad Company series. It was reported by outlets that Bad Company 3 would be the game released towards the end of this year and its setting would be around the Vietnam War. EA confirmed last week that the next Battlefield – which now appears to be Battlefield V – would be available to demo at their EA Play event. EA Play will coincide with E3 in Hollywood, California from June 9th through June 11th. It’s likely we’ll get some form of unveiling for the game well prior to that though. And perhaps even sooner now that the cat appears to be out of the bag.